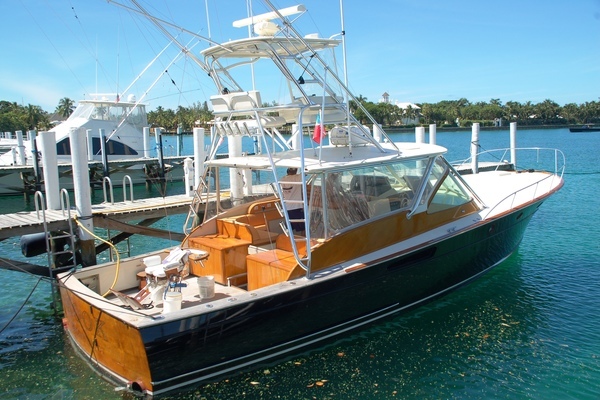 There are few custom sport fishing boats that are as iconic as Rybovich. Known for being entirely customizable to the angler's specific requirements and built with impeccable craftsmanship, owning a Rybovich like akin to owning a piece of fine art. Let the team at United Yacht Sales help you find the right used Rybovich custom boat on the market today that meets your budget and needs. In the late 1920’s is when John Rybovich, Sr., opened a boatyard on the shore of Lake Worth in West Palm Beach, Florida. About twenty years later in 1947, John Rybovich built the first ever Rybovich sport fishing yacht, her name was, Miss Chevy II. He built this yacht with his sons Johnny, Tommy and Emil. This sport fishing yacht, Miss Chevy II, was the world’s first aluminum outrigger yacht and an early fighting chair, along with her fast and seaworthy hull. Later on, in the 1950’s, Rybovich began to use the cold-molding process to construct wooden hulls. After the death of son, Tommy Rybovich in 1972, the shipyard changed hands numerous times. A Florida businessman and sports team owner, Wayne Huizenga Jr., purchased the original shipyard of Rybovich Yachts in 2004 and converted it into a superyacht refit, service and repair shop. Emil Rybovich, his son Michael Rybovich, followed in his father’s footsteps and opened Michael Rybovich & Sons in the year 2010. 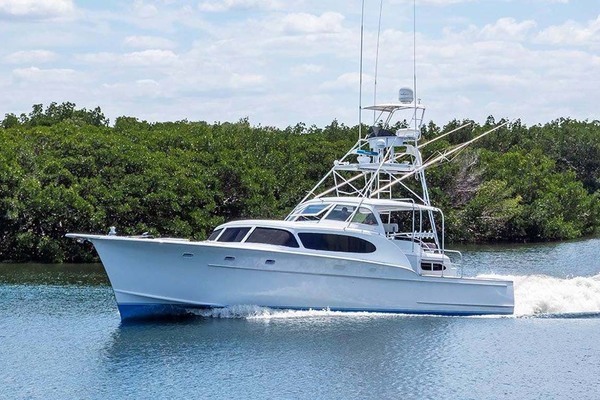 Michael Rybovich & Sons constructed custom cold-molded wood sport fishing yacht as well as providing services for all yacht repairs and up-keeps. Later on, the name became known as solely Rybovich, where they offer a wide variety of services to this day, as well as serving brunch every Sunday! The Rybovich 63’ Convertible has so much to offer. There is a galley, salon, master stateroom and two guest and/or crew cabins, guest/crew head, flybridge and so much more aboard this yacht. As for the cockpit or as you may call it, the fishing area, is equipped with a double freezer, teak decking, fish box, fresh water, a BlueWater fighting chair, outriggers and a center rigger. These are just a few things to name off of the top of the list of amazing amenities that the cockpit has to offer aboard the 63’ convertible. The Master stateroom has a queen centerline berth with lower bunk storage and hanging lockers. There is also a private head with a full shower designed with teak and holly flooring. As for the guest/crew cabins, there is hanging lockers, over and under bunks along with storage under each. The guest/crew head has the same flooring as the master, teak and holly, and is also equipped with a shower. Just taking one glimpse at this yacht, it won’t steer you wrong. It is absolute gorgeous and is waiting for you to take her for a spin. This yacht is just as wonderful as the 63’ convertible just in a smaller length. The galley has a wood sole, built in undercounted stainless steel lined refrigerator and freezer, the countertop with a sea rail and a generous amount of storage. The master stateroom has high gloss teak, drawers below the lower berth, private access to a head and a well-lit makeup/vanity area. The forward stateroom is the other room aboard. This stateroom as well has high gloss teak, oversized hanging lockers and again, an abundance of storage. The head is not attached but it’s just a few steps away with a marble countertop, mirrored ceiling, and an oversized stall shower. As for the cockpit, the stainless lined freezer does its job well, there is also a large tuna door on board. Some more amenities aboard this yacht are the four flush mounted rod holders and a Rybovich fighting chair! No matter where you go on this yacht, you’ll be sure enough to reel in that big catch! If you’re interested in purchasing a Rybovich Yacht, a United Yachts Sales professional can assist you. All employees are trained to identify as many ways as possible to improve your experience when purchasing a Rybovich Yacht. Being a 100-percent customer-driven business, United Yachts deliver every time. United Yachts Sales has experience and the product knowledge to sell your Rybovich Yacht. Selecting the right full-service brokerage firm when selling your yacht improves the likelihood of a seamless and timely transaction. With over 15 years in business, our devoted Sales Professionals work attentively to provide you with first-class representation.